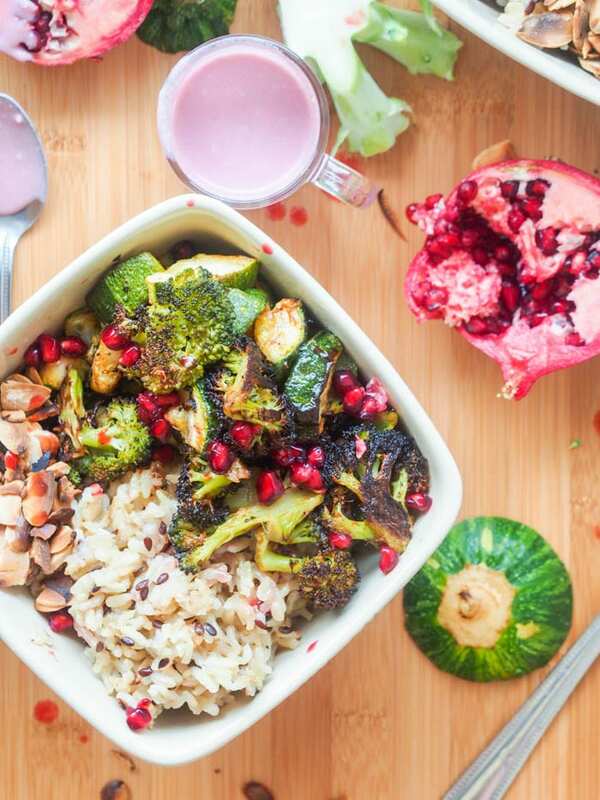 Super colorful and nutrient packed vegan wild rice bowl with roasted broccoli, and zucchini, toasted almonds, pomegranate arils, and a vibrant pomegranate coconut sauce. Ultimate flavor combination. Easy to make and healthy. Perfect for dinner. Gluten Free too. Happy Memorial Day long weekend everyone! Hope the weather is gorgeous wherever you may be with blue skies, sunny days and preferably a grill nearby. Summer should be right around the corner. I am in a bit of a different situation. Having just crossed over into Argentina from Chile, I am well on my way into winter time here in the Southern hemisphere. Cue dark gray cloudy days and cold damp weather. Definitely jacket weather. And when you are only traveling with one jacket, one pair of jeans, and one long sleeve shirt, there’s not much variety in what you wear in this jacket weather. I pretty much feel like I simply have a daily cold weather travel uniform. Blue skinny jeans, black tank top, blue long sleeve shirt, purple jacket, and blue and white scarf. I’m pretty much ready to throw that scarf out the window at this point, I’m so sick of wrapping it around my neck. If only I didn’t need it anymore. Yes yes, I know what you’re thinking, I could easily go out and buy all new clothes. Except it turns out I hate clothes shopping even more than wearing a daily uniform. Maybe I’ll buy some new clothes when I head to Europe next month. Those cute little boutiques are welcoming even to the most reluctant shopper right? 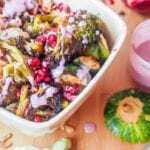 This recipe – this vegan wild rice bowl with pomegranate dressing was actually made on a bright and vibrant day in Valparaiso, Chile. The city reminded me of San Francisco with all the hills dotting the area and the colorful houses. 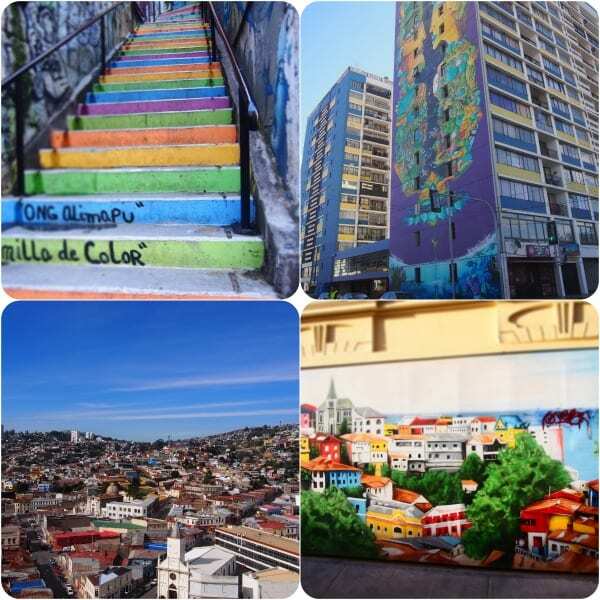 Valparaiso is even more bohemian and hipster though, and after a few cloudy ominous days the sun finally peeked out and those bright colored houses started to shine even brighter. So I needed a colorful and vibrant dish to celebrate the good weather in my colorful surroundings and this vegan wild rice bowl was it! 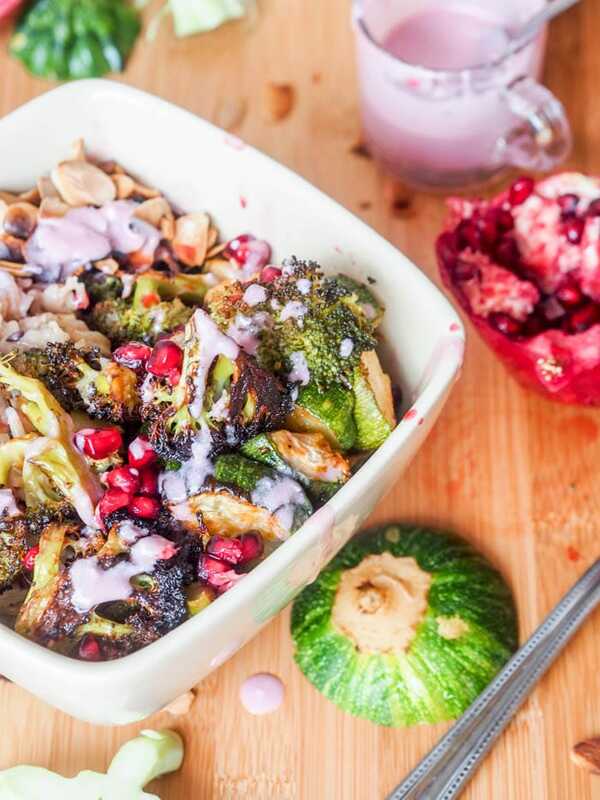 So green roasted broccoli, zucchini and a pomegranate coconut cream sauce seemed to provide all the color I needed. I am all about creamy sauces to go on my rice or quinoa bowls. I love a good avocado sauce with my vegan quinoa power bowls with roasted veggies, a solid pesto and tahini sauce for my vegan quinoa power salad and there’s always the vibrant romesco sauce for my salmon red rice veggie bowls. You get the idea. I love a good veggie heavy power bowl with a killer sauce. Well meet my new favorite pomegranate and coconut cream sauce (which happens to be a an excellent pairing for this vegan wild rice bowl). Pomegranates are highly underutilized in the making of sauces and I’m going to have to change that. Pomegranate juice has the most tender lightly sweet taste, and it’s simply unlike anything else. I can’t compare the taste to anything else. And that’s what makes it so special and different. For the sauce it is simply a mix of freshly squeezed pomegranate juice, coconut cream, olive oil and salt. **A secret tip to get that pomegranate juice: take a whole pomegranate and lightly mash it with your hands, crushed the arils inside as you go and hearing them pop a little bit. Then make a small slit in the pomegranate and holding it over a bowl start squeezing all the juice out. This works like a charm to quickly and easily get a bit of juice out of the pomegranate. As for the veggies those just get oven roasted with a splash of olive oil, salt, pepper and smoked paprika. And the wild rice gets boiled/steamed until ready. Layer everything in one bowl, adding toasted sliced almonds and pomegranate arils as a garnish. And generously pour the pomegranate coconut sauce on top. Talk about a full of colorful flavor party in your mouth. Perfect for summer, and if you’re grilling this weekend, make the veggies on the grill! Let me know what you think of this vegan wild rice bowl in the comments below! Super colorful and nutrient packed vegan wild rice bowl with veggies and coconut sauce. Ultimate flavor combination. Easy to make and healthy. Perfect for dinner. Gluten Free too. Preheat oven to 425 degrees. In a large bowl combine broccoli and zucchini with salt, pepper, paprika and 1-2 tablespoons extra virgin olive oil. Bake on a baking tray, in a single layer, for 25-30 minutes, flipping over half way, until roasted. In a pot cook wild rice according to package directions. To make the sauce combine pomegranate juice with coconut cream, 2 tablespoons olive oil and salt to taste. 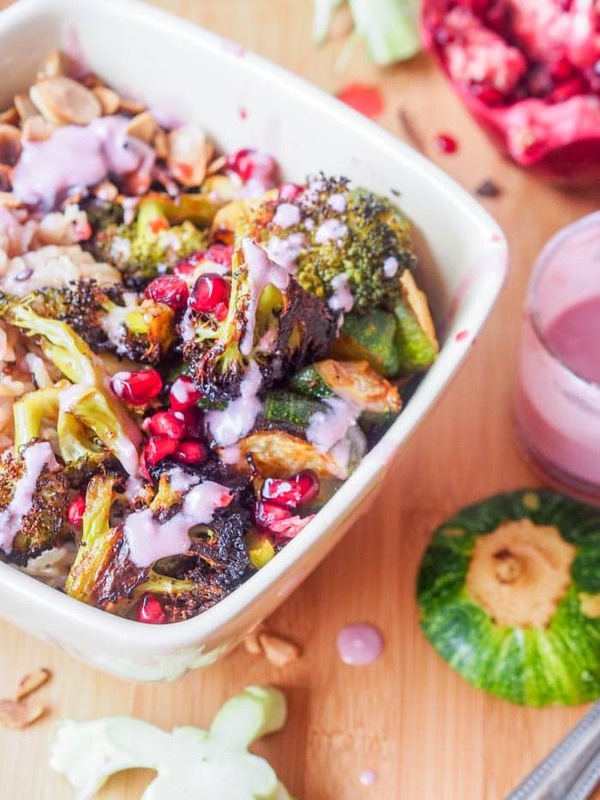 Assemble the bowls with rice, topped with veggies, sliced almonds and pomegranate arils. Top with pomegranate sauce. To make homemade pomegranate juice: take a whole pomegranate and lightly mash it with your hands, crushed the arils inside as you go and hearing them pop a little bit. Then make a small slit in the pomegranate and holding it over a bowl start squeezing all the juice out. This is absolutely STUNNING! I love the bright sauce – and I’ve never tried wild rice before, but it’s definitely on my to do list! Thanks so much! Wild rice is awesome – you’ve got to try it! That is a great tip to get the juice out of the pomegranate…. how did I not know that loving pomegranate as much as I do! Cant wait to make this dressing… YUM! I really like your memory. You are funny about the clothes shopping. Wish my wife did not love it so much :). I really like the coconut cream sauce and the char you got on your roasted vegetables. Haha yes, I think most women have the opposite problem — too much shopping! Love the pictures of Chile! How beautiful! And your bowls are just as vibrant. Recipe saved! This looks delicious! I love all the colors and all the flavor combinations you have together here. A great tip when it comes to juicing a pomegranate. Definitely perfectly hearty for the colder weather!